Keith Cowing (kcowing - at - spaceref.com) [Google+|Facebook|Twitter] is trained as a biologist (M.A. and B.A. degrees) and has a multidisciplinary background with experience and expertise that ranges from spacecraft payload integration and biomedical peer review to freelance writing and website authoring. Keith has participated in month-long expeditions to a remote island near the North Pole and spent a month living at Everest Base Camp covering the first ascent of that mountain by an astronaut. Keith also likes to restore old spacecraft and retrieve their data - especially when the experts tell him that such things are impossible. 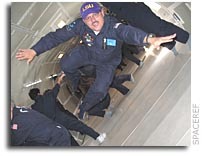 Image Above: Keith is weightless in September 2007 aboard ZeroGravity Corp's "G-Force One". 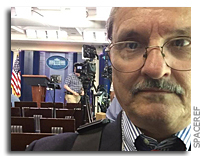 Image right: Keith in the White House Briefing Room in June 2018 while covering a presidential announcement about the National Space Council. Keith is editor and webmaster of the somewhat notorious NASA Watch, an online publication devoted to the free and uncensored exchange of information on space policy and NASA operations. This website is read regularly within NASA, Congress, and the global space community. Keith is also editor of SpaceRef.com an online space news service and Astrobiology.com, a resource about life in the universe that he runs with his business partner Marc Boucher. Keith has appeared hundreds of times on television and radio including ABC, CBS, NBC, MSNBC, Fox, NPR, CSPAN, VOA, CNN, PBS, CBC, CTV, CGTN, Discovery Channel, NHK, BBC, Deutsche Welle, and the Travel Channel and has been quoted in a number of newspapers and magazines ranging from The Wall Street Journal, The Washington Post and The New York Times to The Economist, Wired, and Pravda, among others. Keith appears regularly as a guest on BBC TV and radio and on CGTN. NASA Watch has been cited as a news source multiple times in Congressional hearings by the Chairman of the House Science Committee. In 1998, as editor of NASA Watch, Keith was asked to submit testimony for hearings held on NASA's 40th Anniversary by the House Subcommittee on Space and Aeronautics. A portion of this testimony appeared on the 23 October 1998 editorial page of the Washington Post. Keith has completed suborbital astronaut scientist training at the NASTAR Center - a process that involves centrifuge training and simulated, full-acceleration rides aboard a suborbital spacecraft. Keith also completed two sessions of weightless training aboard ZeroG's G-Force One in 2006 and 2007. If you are wondering, Keith never got sick - once - on any of these rides - and would often shamelessly beg his instructors for a chance to do it all over again. In 2007 and 2008 Keith was the co-organizer of the Lunar Orbiter Image Recovery Project (LOIRP) at NASA Ames Research Center whose task was to refurbish 40 year old tape drives and recover images from equally ancient magnetic tape from the five Lunar Orbiter missions that surveyed the Moon between 1966-1967. With funding and support from NASA, SpaceRef, and SkyCorp, this project achieved success in late 2008 with the release of a dramatically enhanced version of the famous "Earthrise" image taken by Lunar Orbiter 1 in August 1966. With the help of a successful crowdfunding campaign, the remaining thousands of images were retrieved by early 2014. LOIRP was the subject of a recent documentary by the Carnegie Museum of Art titled "Extraterrestrial". 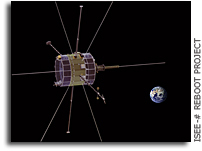 In 2014, Keith was co-organizer of the ISEE-3 Reboot Project with the intent of re-contacting the ISEE-3 spacecraft which had been abandoned by NASA decades earlier. Raising $160,000 in private funds and assembling a team of space experts, the ISEE-3 Reboot team managed to contact and command the spacecraft to fire its engines for the first time in decades. The spacecraft is now sending back science data for the first time indecades that anyone, anywhere can listen to it and use for citizen science activities. This is the first time that a NASA satellite operating in interplanetary space has been controlled by a non-NASA organization. On 8 August the ISEE-3 Reboot Team and Google announced their joint endeavor: a website devoted to citizen science access to ISEE-3 data called SpacecraftForAll. On 18 July 2014 the New York Times featured an op ed by Keith titled "Lost and Found in Space: Rebooting ISEE-3: Space for All", wherein he noted: "NASA likes to say that "space is hard," but to make itself relevant to the people whose taxes fund it, it must get outside its comfort zone. To its credit, NASA saw the potential of our project to reach beyond the traditional audience. The interactions via social media with our supporters have borne this out. Imagine what feats of exploration might be possible if an empowered and engaged citizenry realized that exploring space is really something anyone can do." in 2013 Keith founded a non-profit education organization, the Space College Foundation. Space College is intended to be an educational institution wherein students can be trained for careers in space exploration. The intent is to turbocharge the creation of the next generation of space explorers by expanding access to an overt course of studies focused on space exploration. Unlike other academic and training centers which focus only on classroom studies in one specific location, Space College will reach students regardless of their location. Space College will focus on educating students (and eventually generating graduates) by providing them with a broad, well-rounded background - one suited not just for a career in space exploration, but other professions as well. Keith holding an Apollo 11 moon rock over his head as the moon rises over Everest Base Camp. In April and May 2009 Keith travelled to Nepal to spend a month living at Everest Base Camp at an altitude of 17,500 feet. He went there to do education and public outreach via a satellite link on behalf of the Challenger Center for Space Science Education surrounding the ascent of Mt. Everest by his friend, former astronaut Scott Parazynski. Both Keith and Scott were on the Board of Directors of the Challenger Center at the time. Scott made it to the summit becoming the first human to travel into space and stand atop Everest. With him on the summit was a sample containing four small Moon rocks brought back to Earth by the Apollo 11 mission in 1969. Keith carried these Moon rocks in his pocket for weeks as he trekked thrugh the Khumbu Valley up to Everest. These Moon rocks and a piece of the summit collected by Scott were eventually taken to the International Space Station by the STS-130 Space Shuttle mission. Both Moon and Everest rocks are now permanently mounted inside the station's cupola, the vast windows looking down at Earth. You can read about Keith's and Scott's exploits here. Keith is also a Fellow (National) of The Explorers Club and was a member of a flag expedition to Devon Island (also in 2007) and to Everest Base Camp in 2009. Keith donated his time to serve as an organizer and later, as the proceedings co-editor, for the NASA Administrator's Symposium "Risk and Exploration: Earth, Sea, and the Stars" which was held at the Naval Postgraduate School in September 2004. The proceedings are now online and have been published in hardcover as a volume in NASA's history series. Keith was also co-chair, with astronaut Leroy Chiao, of a follow-on event "Risk and Exploration: Earth As A Classroom" held at LSU in October 2007. In addition to NASA Watch and SpaceRef, Keith is also the editor of Astrobiology.com and has been active in Astrobiology activities since the onset of this emerging discipline in 1996. Keith participated in the first Astrobiology Workshop in March 1996 and the Astrobiology Roadmap Workshop in July 1998 as a member of the Astrobiology focus group. Keith co-authored "Astrobiology at T+5 Years" with NASA Astrobiology Institute Director and Nobel Laureate Baruch Blumberg, which was published in Ad Astra magazine in 2002. Keith was also the guest editor, contributing author, and lead illustrator of three special issues of the National Space Society's magazine "Ad Astra": two issues on Astrobiology (Jan/Feb 1999 and Jan/Feb 2002), and one on terrestrial Mars analogs (May/June 2003). In 2004 Keith wrote a book with fellow journalist Frank Sietzen "New Moon Rising: the Making of America's new space vision and the remaking of NASA". This book chronicles President Bush's recently announced space policy and the process that led up to its development. Keith and Frank broke the news of Bush's new space policy in a series of exclusive UPI articles in January 2004. Keith is currently at work on a book about Astrobiology. Image: Keith standing on a hill overlooking the Haughton-Mars Project Research Station on Devon Island in July 2007. Being a former NASA employee, Keith has been itching to get back into some hands-on space related research. As such, Keith has become involved with the Haughton-Mars Project (HMP), an ongoing research activity conducted on Devon Island in the Canadian high arctic less than 1,000 miles from the North Pole. Keith and his SpaceRef business partner Marc Boucher donated an experimental greenhouse which they constructed on Devon Island in the Summer of 2002. A journal of Keith's month-long experiences on Devon Island during 2002 can be found online here. Keith returned to Devon Island for another month in 2003 (journals). In 2007 Keith returned to Devon Island for a third time leading a team comprised of Astronaut Leroy Chiao and space biologist Matthew Reyes to conduct a week-long series of educational webcasts. This trip was sponsored by the Challenger Center for Space Science Education, The Explorers Club, and the Mars Institute. You can read his journals here. While employed at the American Institute of Biological Sciences (AIBS), Keith managed various peer review contracts, including the FY 94 and FY 95 peer reviews for NASA's Office of Life and Microgravity Science and Applications. Keith also had a senior management role in the AIBS review of 2,668 proposals for the Army's 1994 Breast Cancer Research Project, the largest single peer review project ever performed by or for the Federal government. Image: taken in 2003 inside a Space Shuttle simulator used to train astronauts at NASA JSC. Between 1990 and 1993, Keith was a NASA civil servant and served as Manager of Pressurized Payload Accommodations at the Space Station Freedom Program Office (SSFPO). As part of his prime responsibilities, Keith served as the Payload Accommodations Manager for the 2.5 Meter Centrifuge Facility, the Gas-Grain Simulation Facility, the Gravitational Biology Facility, and the CELSS Test Facility. Keith also participated in all SSF design reviews held during 1990-1993, representing the interests of the scientific payload community. Keith was also the SSFPO lead on biospecimen containment and was a NASA representative to the NRC Committee on Toxicology's subcommittee on Spacecraft Maximum Allowable Concentrations. Prior to his work at NASA, Keith worked for AIBS on NASA Life Sciences Division Peer review and for the Universities Space Research Association (USRA) where he managed a subcontract in support of the NASA Life Sciences Strategic Planning Study Committee (a.k.a. the Robbins Committee). Keith is also a former member of the governing board of the American Society for Gravitational and Space Biology (ASGSB). Keith also designed the ASGSB logo that adorned t-shirts worn by crew members on both STS-40 and STS-58 and by NASA scientists in Antarctica. Keith managed to wear one years later in the arctic. At one time or another Keith's hobbies have included running, skiing, hiking, fossil collecting, SCUBA, and rock climbing (Keith and his wife Jenny met while climbing). Keith has had several other "careers". He has worked as a certified sign language interpreter for the hearing impaired at several universities and signed various speeches from the podium of the 1980 Democratic National Convention; was an advance man, local organizer, and finance officer for Jerry Brown's 1980 Presidential campaign and the 1982 Brown for U.S. Senate campaign; taught biology and sign language on several college faculties; worked on the Space Shuttle Program at Rockwell International's Downey Facility, and served time as an art major (earning an undergraduate degree in Fine Arts). At one time or another Keith's hobbies have included running, skiing, hiking, fossil collecting, SCUBA, and rock climbing (Keith and his wife Jenny met while climbing). Image: Keith at the top of a 7 pitch, 700+ foot climb on Stately Pleasure Dome, just above Lake Tenaya, Yosemite National Park, the most awesome place on this planet Keith has written a number of climbing-related articles. One of them, "Everest On-Orbit" was published in Climbing Magazine. Another, "Oh Mons! The First Ascent of Olympus Mons" was published in the National Space Society's Ad Astra Magazine (their first published fiction). Another climbing-related article "Roger Houston. On Belay" appeared in the Winter 1997 issue of Tranquility Base, the newsletter of the 2111 Foundation. Keith also wrote about a rather spectacular climb (at least he thinks so) in Rocky Mountain National Park called The Petit Grepon and a introspective travelogue called "Going Off Source: Time away with SETI in West Virginia". In 2004 "Mountaineering and Climbing on Mars" was published in the Journal of the British Interplanetary Society.